Last night I was lucky enough to go and listen to Australian-Irish author Monica McInerney speak. I didn't realise it last night, but it has actually been more than four years since I last read a book by her, but she will be an author who I will always have fond memories of reading. Monica writes funny, emotionally connecting novels that generally centre around a family, and the dynamics between those family members. The first book I read from her was The Alphabet Sisters. I picked it up on one winter afternoon and ended up reading straight through from beginning to end. I laughed, I cried, and I was definitely emotionally moved! Last night Monica's speech was entertaining, gracious, and very enjoyable. A couple of things that she talked about were the superstitions that she developed whilst writing her latest book, which is called At Home with the Templetons. Some examples were having to do certain actions before emailing her manuscript to herself each day, or having to do certain things on her daily walks. She started off saying that she never had that experience before where superstitions became so imperative to her process, but as she talked, she was realising that she actually had. They were just different superstitions for each book. It was funny because I took two of my older books by her to get signed, and then yesterday I also bought the new book. When I went up to get them signed, she put them in chronological order, and then looked at me in surprise as she realised that was yet another habit that she had - when she signs multiple books it has to be in the order that they were published in! Monica also talked a bit about the process of getting published in the US, and in particular about the general practice of changing particular words in books for the US market. The example she gave was in relation to her previous book, Those Faraday Girls. In the first few pages in the original novel, the characters walk down the pavement in Hobart and they are talking on their mobile phones, and then there is something about changing the nappy on the baby in the story. When Monica received the proofs back from the American publisher they had changed it so that the characters were walking down the sidewalk talking on their cells, and the baby's diaper was changed! She fought successfully to get those changes reversed because if the novel is a picture of life in Australia, then that is not language that we used. I know that this can be a bit of a bug bear for readers, so it was very interesting to hear an author talk about this issue. She also shared some of the overseas covers that she has had over the years, as well as talking about translations. Most of the covers were very nice, but there were a couple of shockers! Her current book, At Home with the Templetons, has just been released in Ireland (where she currently lives) and Australia, and will be reduced in the US and UK next year. Do you find yourself making connections between books when you are reading? 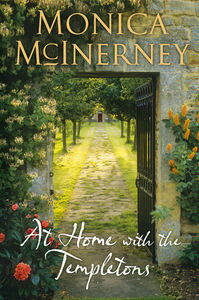 Monica McInerney grew up in a small town in South Australia called Clare which was about an hour or so away from where I grew up. The Alphabet Sisters was set in Clare. The book I am reading at the moment is Lady of Hay by Barbara Erskine, and the last time I picked up the book, the main character visiting a place in the UK called Clare, and one of the major characters is a member of the de Clare family which was a powerful family in Medieval England. Oh, and my friend and I were chatting away very amiably in the signing lane with a lady whose name was Clare, although she spelt it differently! After a bit of book pimping for the author I always pimp (Susanna Kearsley, Elizabeth Chadwick, plus Ariana Franklin) and some mutual discussion about Diana Gabaldon, we went our separate ways. It's a tenuous connection, but I couldn't stop thinking about it all day yesterday! Another connection, my favourite wine maker comes from the Clare Valley. Wasn't enough to get me to open a bottle last night, but I might tonight seeing as it is Friday! You all know how much I hate having my photo taken (hair is very flat, makeup needed to be touched up, stooping is really not such a good idea), but I had to take at least one photo to put up here. Anyway, I am really not the important person in the picture! Wow, I'd love to hear Monica speak! The Alphabet Girls was the first of her books I read and it was so sad. She's a great author. Great interview, and so, so funny that she signs her books in chronological order!! I am going to have to check out Alphabet Girls.